Last month my baby girl turned 2 years old, I can't believe how fast the last 2 years have gone by, it seemed to take forever for Riley to turn 2. Having her around for the last couple of years has been a completely different experience to raising her older brother, in many ways a lot harder but I wouldn't change a minute of it. Summer is an incredibly clingy child, she started off very independent but when she hit 14 months old she started going through what I thought was a clingy phase that would last a few weeks but almost a year later she's still really clingy and just when I think it's easing off she manages to take it to another level. She basically has to be touching me pretty much all the time, if I want to pop into the kitchen to get a drink she has to come with me, if I need the toilet she has to come with me and sometimes even sit on my knee which is not fun, if she's feeling particularly clingy then she will open my dressing gown or cardigan and actually climb inside so that she can be even closer to me. She won't let Riley get close to me and she even gets jealous of the dog, it's ridiculous at times and really makes me feel quite trapped and claustrophobic but on the other hand it feels nice that she loves me so much, I have very mixed emotions about the situation. She's so brave, something that her brother could definitely learn from, she had no qualms about stroking Minstrel the ferret and she climbs up stairs and ladders without a single ounce of fear. I love this about her but I also hate it because it means she is more likely to get hurt and I have to watch her like a hawk at all times. Her courageousness is rubbing off on my son though which is good because his over cautiousness gets in the way of him having fun sometimes, they could both do with finding a happy medium. Summer's relationship with her brother is adorable, she follows him everywhere and she wants to do everything he does. They play together really nicely and although they do fall out sometimes they always make up really quickly and are the best of friends again, you can read more on their relationship in my Siblings posts. Her speech is excellent and I've been able to have a full blown conversation with her for months now, Riley was also a very good talker and has a huge vocabulary for his age so this seems quite normal for me but I know not all 2 year olds talk as much as she does. She doesn't know colours, shapes or numbers yet though so I probably need to work on that more with her, I feel like I had more time for this kind of thing with Riley and I should make more effort to do the same with Summer but finding time when there's two of them is difficult sometimes. As well as being very cheeky Summer is very loving and quite maternal, she likes to mother other children and toys, she's always asking everyone if they're ok and she likes to tuck Riley in at night and kiss his head as if she was his mummy, it's lovely to watch her and makes me feel very confident that she will make a wonderful mother one day (although the thought of her having children of her own horrifies me at this point lol). My favourite thing that she does is something she mostly does when she's tired and snuggled up next to me or inside my clothing, she takes my face in her hands and turns my head so I'm looking at her and she just stares into my eyes like she's looking into my soul while she holds my face. It's our little moment together, just me and her and I love it, I hope she never stops doing it. Summer started pre school last week, she just goes two mornings a week but I wanted her to go so that when she starts nursery it won't be such a big shock. She really surprised us by not crying the first morning that we left her but unfortunately it has got worse since, this morning was her forth time going and she cries at the very mention of school, she cried while she put her coat and shoes on and by the time we got there and were getting out of the car she was really upset. 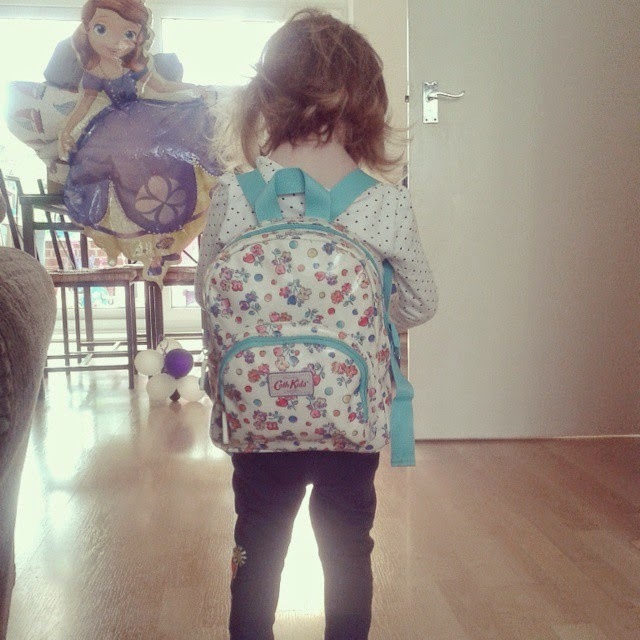 I've not felt too bad taking her to pre school so far but yesterday morning broke me, seeing her big, teary eyes and trembling bottom lip as she tried desperately not to cry absolutely broke my heart, I could hardly bear to take her inside and hand her over and I had to run back to the car as quick as I could before my own tears started to flow. I know it's for the best and she'll get used to it because I've been through this all before with my son but it's so hard sometimes, I was so excited to pick her up. My daughter is growing into a beautiful, funny, intelligent, loving, amazing little girl and I can't wait to see what she will become although I do sometimes wish she was still a chubby little newborn at times, it doesn't matter though because she'll always be my baby and that will never change.